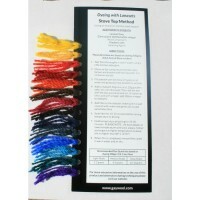 Gaywool Color Cards, Starter Kits, Display Units and accessories are available to assist with the dying experience. 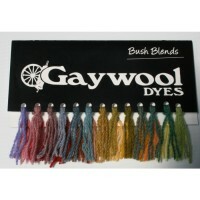 Each of these products are available with the four types of Gaywool Dyes: Originals, Bush Blends, Lanasets and Acid Dyes. Originals and Bush Blends require no additional dye bath prep; imply use the contents of the package. 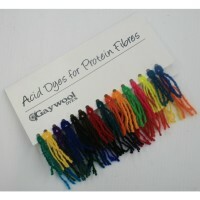 Safe, natural, easy, colorfast, reproducible and economical. The Lanasets and Acid Dye categories do require a dye bath additive such as vinegar to reduce the ph and provide luxurious, deep colors. 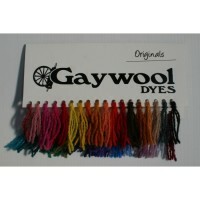 New to Gaywool Dyes? Try a Starter Kit, which includes everything necessary to begin your dying experience.